This series, for me, has been an exercise in indifference. I was indifferent to the first book, Abandon, and had I not borrowed the second one from the library at the same time I borrowed the first one I probably wouldn’t have read it. After reading Underworld I figured I had already come this far and I should read Awaken just to finish things up. That brings us to this point. I finished Awaken and want to know how I feel? Indifferent. From the outset I neither loved nor hated Pierce. She was simply the main character and nothing she did ever seemed out of the ordinary or pulled me in one direction or the other. She never pissed me off with her decisions or left me wanting her to be more aggressive. Pierce is just there, and this novel felt no different. I did like that she embraced John and her position as consort of the Underworld in this novel though. Then there was John, he was silent and brooding as ever, he actually was missing for a portion of the novel and his absence was felt. I guess in that section of the novel I liked Pierce a little more just because she was expressing emotion and working toward getting John back. In all honesty the synopsis (which can be found here) for this book is way more exciting then the book itself. I feel like while the stuff listed in the synopsis happens it was presented in such a manner that left me feeling blasé. This novel didn’t suffer from a lack of action either. I think the problem, for me, was that the action never felt immediate or like anything important was on the line. Either they solved the problem or they didn’t and I couldn’t bring myself to care either way. Overall, this book wasn’t bad it just left me feeling nothing and I probably won’t remember what happened in it this time next year. There were no technical problems I just think this series suffered from a lack of soul and because that something intangible was missing from the story I wasn’t able to ever really love it. 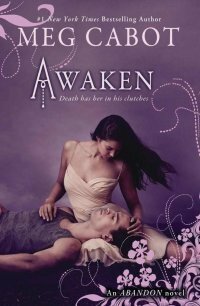 Thank you Scholastic and Netgalley for allowing me to read an advanced readers copy of Awaken.